He does everything in his book trailer. Neil Patrick Harris is a national treasure. And now with his new autobiography, Neil Patrick Harris: Choose Your Own Autobiography, we can all take a piece of him home with us. 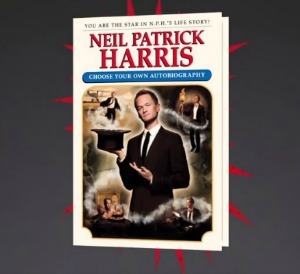 To promote the book, NPH has made a video clip in which he shows the depth and breadth of his talents. Watch him take shots of rubbing alcohol! Watch him eat a piece of spaghetti with his hubby David Burtka like Lady and the Tramp (aww)! Listen to him do the warm up that he used to go through when he was in “Hedwig and the Angry Inch”! Oh my goodness, there is so much NPH. Book trailers have been a thing for a while now, a great way for those authors with good screen presence to make a video clip that can get passed around and add to the usual routes for book publicity. A television star with Tony and Emmy awards on his mantle, years of screen experience, charm and a cute husband… this could only be a marketing win. The book will be for sale on October 14.